I love making marmalade. There’s something special about putting the orange’s poor cousin to good use, especially at this time of year when there are more than you can reasonably eat or juice for breakfast. It’s the same attitude that resulted in Janet and I making plum ‘everything’ last Xmas. We lost count after harvesting 20 kilos. The tree is laden with blossum so it bodes well for this Xmas. 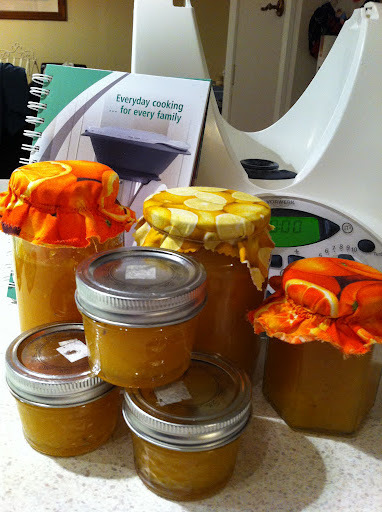 I was amazed to find a recipe for citrus marmalade in the Thermomix cookbook so of course had to try it. Seriously impressed with how the machine performed and how quick and easy it was, with very little mess. A kilo of sliced grapefruit and water softened in Thermomix for 10 minutes on 100 degrees. Add 800 gm of sugar and cook 5 minutes at 100 degrees. Continue to cook for another 10 minutes until it gels when tested. I poured the marmalade straight from the bowl into sterilized jars. No huge pots to clean and no sugary sticky overflow to scrap off the stove top. But it still filled the house with delicious smells. So, a big tick for Thermomix marmalade. Oh, one of the lids just popped so that’s a good sign! I’ve never made butter. I try not to eat too much of it on account of it being fat. It would be completely unrealistic for me to make my own and not eat it all. But, I have a responsibility to you all to make good use of my time with the Thermomix so I selflessly put aside my aversion this week. I couldn’t help thinking what Grandma Ruby would think of me making butter in 3 minutes. Put in the cream. Blend for 1-3 minutes. Strain off buttermilk. Add cold water and mix again for 5-10 seconds. And wouldn’t you know it. There’s a recipe for Buttermilk bread. I do not own a bread maker for a very good reason. Bread is one of my many many weaknesses. But I launched into the bread making process knowing that the son and husband would love it. Everything in the bowl (Buttermilk, water, yeast, salt, flour and oil) Mix for 5 seconds. Set to knead for 3 minutes. Place in warm place to prove. Knead slightly, shape dough and cook in oven when it’s doubled in size. I wrapped it in a special mat that aids the proving process and popped it in a warm oven that was turned off. My dough seemed quite sticky to the touch but didn’t actually ‘stick’, if that makes sense. 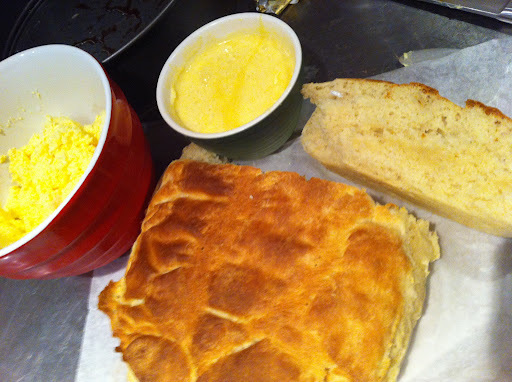 I served a huge chunk of hot bread, homemade butter and lemon butter (also made in the Thermomix) to the resident student for a late afternoon tea. Woof! Stirring the hot stock into the rice is one of life’s pleasures as you watch it transform into the creamy goo that is risotto. But I don’t usually cook it on a school night. With the comings and goings in our house I’m never quite sure what time we’ll all be ready to eat and I think risotto needs to be served immediately. Getting the consistency of risotto just right takes patience and time so I was curious that the recipe involves adding the stock all at once and cooking gently for 16 minutes – no stirring, no fuss. Chop onion, garlic and parsley. Add oil and saute. Add rice and wine and cook 2 minutes. Add stock and mushrooms and cook 16-17 minutes. Add parmesan and butter. It was really odd to just walk away from it – but I did! MasterChef was on and while I hate the whole concept of that damn programme, they are in Italy so I had to put my principles aside … temporarily. 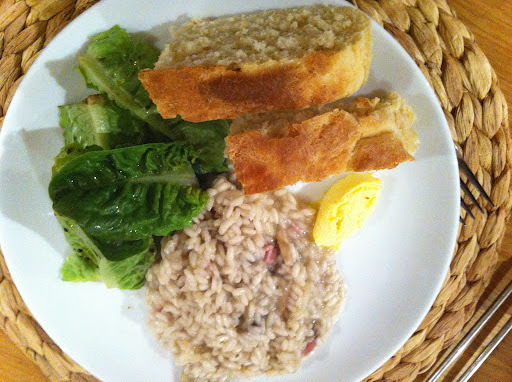 The risotto was perfetto! Yes, served with more bread and homemade butter. We finished dinner with Farr Breton Aux Pruneaux, a traditional French prune cake. Once again all ingredients in the Thermomix, then gently poured over rum soaked prunes and baked in the oven. 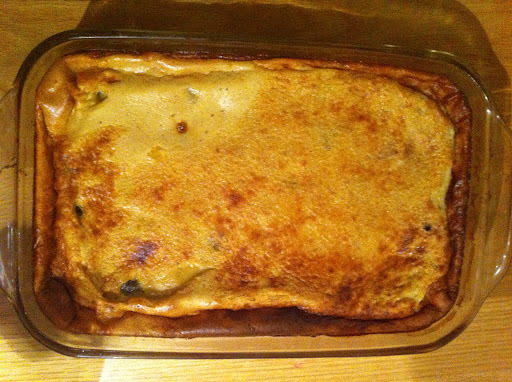 The texture is like a clafoutis – the soft plump prunes a scrumptious addition. ( Sorry, the photo doesn’t really do it justice.) We groaned our way off to bed! 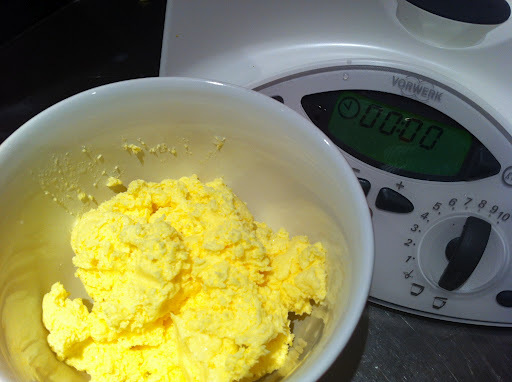 Oh my goodness – what that whizz that Thermomix has been. Love the fact that you made all you need for the perfect Breakfast. I am certainly warming the the potential for this magical machine. Thank you Heather, another great informative entry….with each one, the thermomix is creeping up my kitchen priority list! Weird reading this from India where it’s wood fires heating the hot plates and pots that all wobble about. You’re doing a great testing job for us Heather. So do we get a follow-up on how the last day of the trial went, what your final thoughts were and whether you will have to make some space in your kitchen?